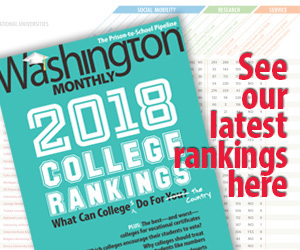 Washington Monthly | Perfect Jobs Report? After all the recent stock market craziness, attributable in part to angst over the long-awaited tiny boost in interest rates by the Fed, you had to anticipate the August Jobs Report with very mixed feelings. Anything too good would make the rate increase all-but-certain, sending the markets into another swoon. So I guess the actual report was about all you could hope for: net job gains of 173,000 jobs, a good 20-30k below most economists’ expectations, and likely to generate “job growth slows” headlines (BLS also revised the June and July jobs numbers upward by a total of 44,000, making the August numbers look even more paltry). On the other hand, the official unemployment rate dropped to 5.1%, which doesn’t mean a lot to investors, but will matter to voters next year, particularly if the rate drops below 5%, which now appears very likely. There were also small increases in wages, but not enough to justify the ever-ready inflation fears to emerge. We’ll see if this threads the needle with the markets and/or the Fed. Real shame we have so little control over the direction of our economy.